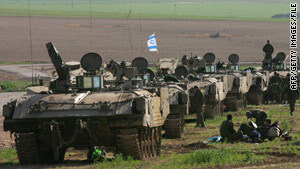 Israeli troops and armored vehicles wait on the Israel-Gaza border in January. U.N. report accuses Israel and Hamas of "actions amounting to war crimes"
Jerusalem (CNN) -- The Israeli government has ruled out setting up an independent investigative body that would interview Israeli military personnel about allegations that the military committed war crimes during its offensive against Hamas earlier this year. According to an Israeli government official, Prime Minister Benjamin Netanyahu on Sunday met with representatives from the Defense, Justice and Foreign ministries to discuss the 575-page report -- approved by the U.N. Council for Human Rights earlier this month -- which accuses both Israel and the Palestinian movement Hamas of "actions amounting to war crimes, possibly crimes against humanity" during the three-week offensive which ended in January. The aim of the meeting was to develop a coordinated government strategy for combating the report, which Israeli President Shimon Peres has rejected as "one-sided" and "unfair," said the official, who asked not to be identified because of the sensitivity of the topic. During the meeting, Netanyahu expressed his confidence in the Israeli military to carry out its own investigation into charges of misconduct during the offensive, the official told CNN. The prime minister suggested that "he would not agree to any proposal that would mean that soldiers or officers would be interrogated outside of the army investigations," the official said. The U.N. report, based on a fact-finding mission led by South African former jurist Richard Goldstone, calls for both Israel and Hamas to independently investigate the alleged human rights violations cited in the report. The U.N. Human Rights Council approved a resolution supporting the controversial report. Israel rejected the resolution and has been waging an aggressive public relations campaign to repudiate the report's findings. The council has submitted the report to the U.N. General Assembly for its consideration. The report asks the U.N. Security Council to monitor any independent probes. If that group decides the investigations have not been done satisfactorily within six months, the report recommends that they refer the issue to the International Criminal Court in The Hague. There are some in the Israeli government who have voiced support for an independent investigation, arguing that it would help prove that Israel acted morally during the three-week war and that it would decrease the chances of charges being brought in the International Criminal Court. But it's a move that has been strenuously opposed by the Israeli defense establishment. "We sent the soldiers on the mission and they deserve our complete backup," said Israeli Defense Minister Ehud Barak in a statement Sunday night. Israel said its three-week offensive in Gaza, dubbed Operation Cast Lead, was designed to stop Palestinians from firing rockets and mortars into Israel from Gaza, which is controlled by Hamas. There is an ongoing dispute about the number of people killed in the offensive. The Gaza-based Palestinian Center for Human Rights put the death toll at 1,419 and said 1,167 of those were "non-combatants." The Israeli military released its own figures earlier this year, saying that 1,166 people were killed, 60 percent of whom were "terror operatives."